This was a simple, tasty recipe pairing. The medieval leek soup took all of 5 minutes to prepare, and the result was an interesting, tasty broth with a bit of kick. The pepper and ginger lengthen the feeling of heat in your mouth, transitioning from the temperature of the hot soup to the warm sensation of the spices. If you were a monk traveling the open road and cooking over campfires, the modern recipe would be your dinner of choice. The citrus flavor makes the soup wonderfully fresh-tasting, perfect for a spring evening with a chunk of sourdough bread. Leeks are a gem of a veg, underused in cooking these days. Try both recipes and let us know your favorite- viva la leek! Wash the vegetables; slice the leek finely and dice the mushrooms. Add saffron to the broth and bring it to a boil. Add the leek, mushrooms, and powder fort to the broth, simmer 3-4 minutes, remove from the heat, and serve.We prefer to use beef broth, but it is also good with chicken. Trim the green end of the leeks to about 3 inches above the white, and cut root end. At root end, slice a cross to about halfway up the stalks, and rinse. Slice the leeks into thin rings. Melt the butter in a large saucepan and add the leeks. Cover and simmer over a low heat until the leeks are softened, but not colored. Chop the celery and carrot and add to the pan. Pour in vegetable stock, add bay leaves, salt, and pepper, and leave to simmer for 20 minutes or until veg is soft but sill vibrantly colored. Rinse the spring greens and shred into thin ribbons. Grate the lemon zest and drop into thepot with the shredded greens. Simmer for 2-3 minutes until the greens are just tender, juice the lemon into the soup and serve. This is amazing! love this website, and the great world the recipes come from! Ground Saffron? GROUND Saffron? Madam, how DARE you! I didn’t have ground ginger so I just diced some ginger root. I also forgot the saffron, but still this was very good and very easy and quick to make. Thank you and keep up the good work. I made the modern version, and used a bunch of dandelion greens and some baby broccoli and it was great! I really enjoyed the food descriptions in A Song of Ice and Fire, I’m so glad you’re experimenting with them. I love your blog! The pictures really make it everything come to life. I made the Middle English version the other night–turned out great. Very simple. If you can, use homemade stock. Leaps and bounds better than anything store-bought. I added a few diced stalks of garlic shoots (the green part of the plant, tastes like scallions). Great addition. We had this soup with the white beans and bacon. Went very well together. Oh, the type of mushrooms you use can make or break the dish. 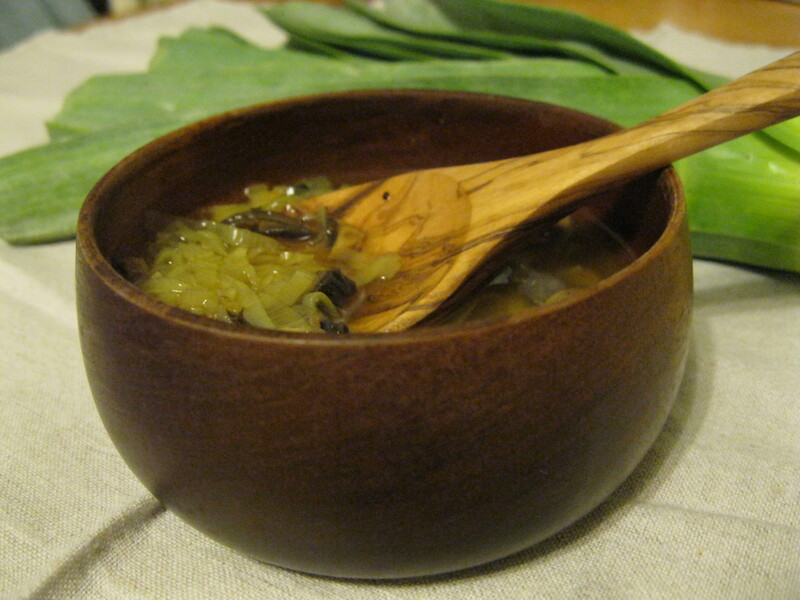 I used wood ear mushrooms. Next time I’m going to try oyster mushrooms. Try crimini! I used a bunch and it made the soup so earthy and rich. I made the medieval version yesterday, and added a carrot for good measure. I’m sure that you could add many different kinds of vegetables or meat to this soup, but the basic recipe is already very, very good by itself – so good that I made it twice. Seeing all these wonderful foods come to life is awesome! I made the medieval version a few weeks back and it was fantastic, though it really only made enough for two, so I had to double up the recipe. We had a vegetarian in our viewing party, so we just substituted some Better than Bouilion (veggie base) in lieu of the of the beef/chicken broth and it still came out fantastic. I love this blog! I made this today (the modern recipe) and added some endive instead of spring greens (going to be making some of the white bean and bacon later). It’s wonderful, I would suggest that you go easy on the lemon; I may have used too much and it took over a bit. Otherwise it was amazing. Would definitely make again. I should also mention that I added some tofu for protein because I was too lazy to cook chicken. Worked well. I initially made the modern version for our GOT season finale feast. It’s now become a staple in our house – It is light enough to eat through the summer with a salad or bread and cheese, but still flavorful enough to eat into winter for a little pick me up. I just add a bit more pepper. I’ve done this with swiss chard because I had some to use up. I didn’t like it as well as just spring greens or arugula, but it was still super tasty! Thanks for introducing me to this great soup! I made the modern Leek soup last night. My wife loved it. I did enoy it, though I feel like I over lemoned it. I juiced an entire lemon, and I feel like it hid the other flavors. Was that too much? If so, can you specify how much to juice in your recipe- one whole, half, wedge? All the same, she pointed out this may be a fantastic soup for a cold. Although, I think part of the fun here may be to do what works….I added black mushrooms shreds to the modern. I couldn’t resist. I look forward to trying pork pie very soon. Modern and Medieval. I love your work so much! There are so many reasons I love your work I can barely begin to tell you them all. For starters I love the fact that your work is based upon the gustatory fabrications of an inspired (possibly hungry) imagineer. You are also very talented imagineers to have recreated foods from mere descriptive words (and true a bit of historical digging). I absolutely must have your cookbook to study and cook from. I know many a group of people who will benefit from full bellies and satisfied tongues from your historical/fantastical works. I’ve been making the medieval version about once a month since I read about it here, though I’ve been leaving out the saffron as the average price here in montreal seems to be about 6.50$ a pinch. My girlfriend and her father had nothing but good things to say when I made it with chicken stock, the beef stock was..less popular. I love leeks! This will be a must-try. This was very tasty and took only only about 30 to 45 min to prepare. I added some oyster mushrooms instead of the celery and only juiced half a lemon. Went on a hunt for a leek soup recipe and found so much more… THIS BLOG! A treasure in the blogoshere :) Off to make soup, be back later to read more! We made the medieval version with some chicken broth left over from a slow-cooker chicken recipe and it was AMAZING. My husband loves cooking with leeks. We’ll definitely be adding this to our usual recipe rotation! I would like to know how many servings the Medieval recipe makes? I’ll be feeding 20 very hungry folk. Love this site! Not many- I’m guessing about 2 smaller servings. Happy feasting!